South of North is a Nordic collaboration project between twelve young architecture practices working in the non-profit sector in developing regions. The members of the South of North network aim to use their professional skills to support underprivileged communities. Some of the most significant impacts of the collaborative thus far include improving the livelihood of women in Senegal, promoting ecological sanitation in Fiji, and the proliferation of bamboo construction in Cambodia. The South of North traveling exhibition was presented in Helsinki as part of the Helsinki Design Week, 5 –14 September 2014. 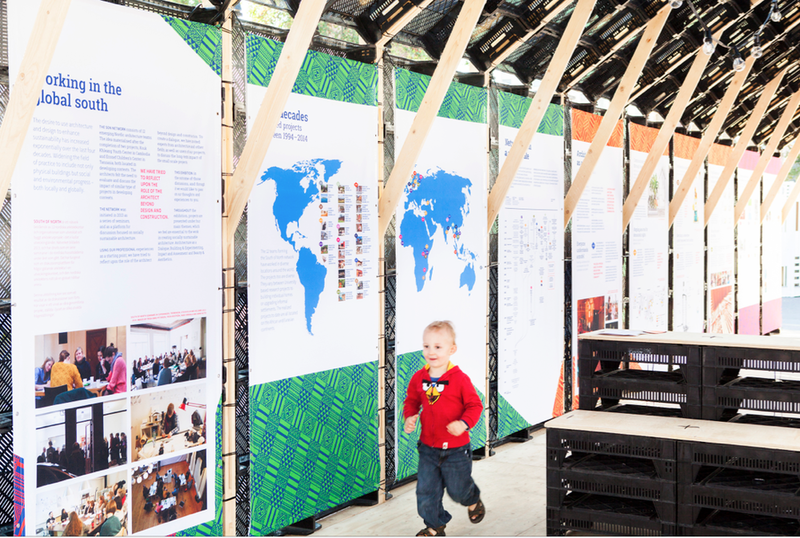 The exhibition, which is now displayed in the South of North webpage, gives a Nordic perspective to the globally growing phenomenon: emerging architectural practices committing to global issues related to ecological and social sustainability. The exhibition pavilion was constructed of recycled materials, reflecting the design principles of the South of North network. The walls and the roof are constructed of old potato boxes which will be returned to their original use after the exhibition. As a part of the 14th International Architecture Exhibition, the Venice Biennale, South of North hosted Mouthful of Meetings on 19.9.2014, a seminar inviting contemporary African and Nordic architects to a cross-cultural dialogue on socially engaged architecture. Project and exhibition core team: Pilvi Vanamo, Inari Virkkala, Frida Boström, Noora Aaltonen and Elina Tenho. Graphic design by Annika Järvelin and Lauri Kerola. Photographs by Anna Autio.